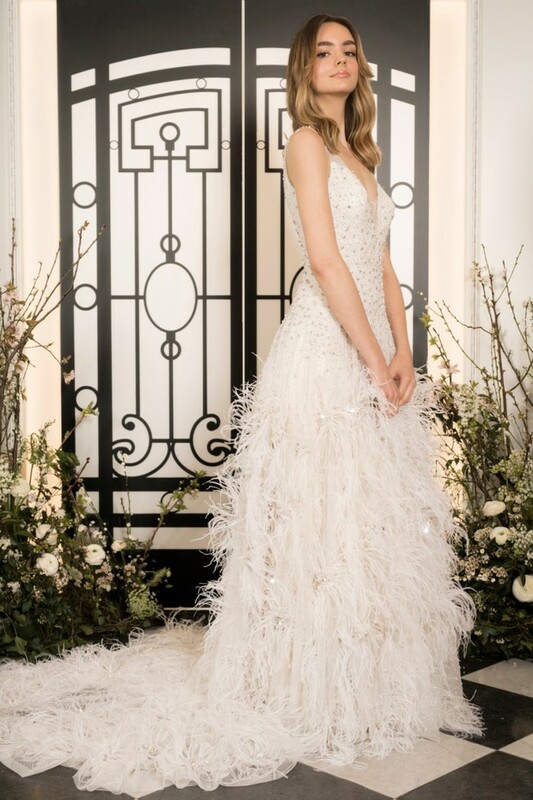 Jenny Packham's 2020 bridal collection is here, and man are we obsessed! This delightfully modern and elegant collection pulls inspiration from the three fashion capitals of the world. Paris lends the loving ardor often found within its city limits to the romance and sentiment of draped chiffon and voluminous skirts. Buenos Aires is a sensual and soulful city with a passion for carnival and dance, all of which are reflected in the silhouettes of the Jenny Peckam 2020 collection, from intricate embellishments, fishtail skirts, and plunging necklines. And not to be outdone, the vibe of New York City, a city that never sleeps, this collection bring a high-octane glamour with high-low hemlines, crystal encrusted mini dresses, and ostrich feather trims. Are you ready for this collection?! You can find every last piece in the full gallery, but first, enjoy scrolling through our top five faves of this amazing new bridal collection.